Holi 2019: With a colourful doodle, Google marks the festival of colours which is celebrated to mark the end of winter and the first day of spring. 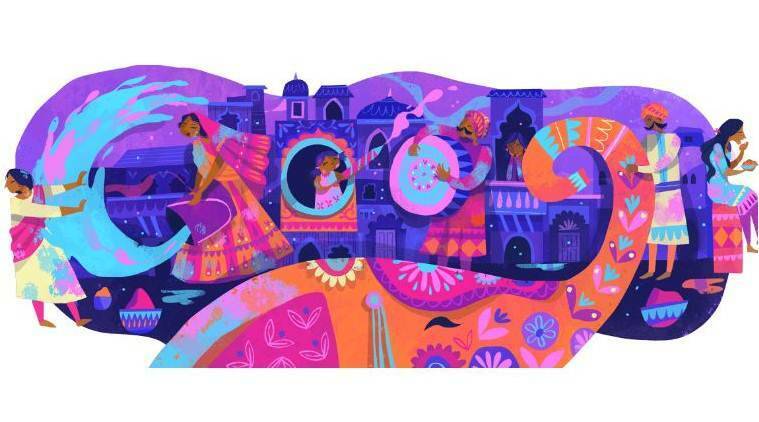 Holi 2019: The Google Doodle has been created by Chennai-based artist Chaaya Prabhat. On the occasion of Holi, Google Thursday dedicated its latest doodle to the festival of colours which is celebrated to mark the first day of spring and end of winter. The doodle depicts revellers splashing colours on each other while one person is playing an instrument and another is eating sweets. The artwork has been created by Chennai-based artist Chaaya Prabhat. Holi has several mythological significances, the most popular is the story of Hiranyakashyap and another one is of Krishna celebrating with colours at Vrindavan and Gokul. The festival is celebrated by many non-Hindu religions also, like the Jains and Buddhists, and is celebrated in many south Asian countries too. Traditionally, on the night before Holi, a bonfire is lit symbolising the victory of good over evil. People circle the fire called ‘Holika dahan’ or Choti Holi and smear ash on their faces recalling the story of how demon Holika tried to burn her nephew Prahlad but got burnt herself instead. The following day, people come together and play with coloured powder. This practice of playing with colours is inspired by Lord Krishna who has been depicted playing Holi with his beloved gopis in several mythological references. It is said, on this day people forget old grudges and come together to celebrate the festival.